When most people think of acting and breaking into the field, they assume that you just head down to the casting call, audition, and hope you get the part. To a degree, that’s actually not far from reality. But did you know that an acting resume is a key part of the process too? Most don’t realize that until they start trying to break into acting, and at that point they discover that crafting a great acting resume is something that is just as important as a headshot or developing their craft. Your resume is kind of like your calling card in the industry. Casting directors will require one when you come in for an audition, and it gives them a chance to learn a bit more about you and whether or not you’re suitable for a particular part. But how do you create a resume? What do you do if you have limited experience in acting to include on that resume? All of these questions are worth taking a closer look at, and getting answers is easier than you might think. Let’s take a look at the process of creating your acting resume. 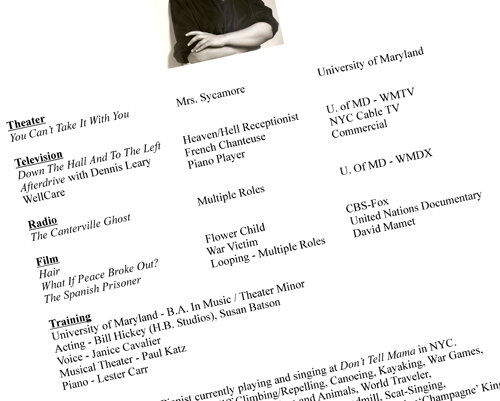 The first step is understanding the basics of how a resume for acting is crafted. They’re very similar to any professional resume in that they need to include all basic info that is applicable to your acting career. You don’t need to include things like a job at Arby’s or your current place of employment. Instead, you’re focusing on what will help you stand out to a casting director. Here are the basics. Start with your stage name at the top of the resume. Use a large, bold font for the name and follow it up with a smaller font detailing your contact info – don’t forget your email address. It’s the preferred method of communication for many in the industry today. List physical descriptions of yourself. This includes hair color, height, weight, shoe size, and your clothing sizes. This helps speed up the job of wardrobe should you land the part. Now you need to list your experience. Be sure to break down this section according to the type of acting you did. Label one section with ‘Commercials’, one with “Theater”, and so on. Under each category include the name of the project, the production company name, and your role. No part is too small here – you should even include appearances as an extra or even a part in a high school play. You’ll also want to include a Training section that details any acting classes you’ve taken. Include the type of class, specific skills it focused on, and the instructor’s name. Now include skills that could help you stand out. For example, can you juggle or skateboard? Do you have a history in horseback riding or rock climbing? All of these could be needed for a particular part, so include them as needed. These basic points are what you need to include in any acting resume. If you’re still unclear about how to format the resume, don’t hesitate to look online for some examples or templates to use to craft yours. Just be sure to be honest when creating your list of experiences – nothing will get you blackballed from the industry faster than outright lies. Along with the basics there are several key things that are worth keeping in mind when crafting a resume. Some are touched on above but deserve additional mention, while others may not stand out as obviously to you. When you have little to no acting experience, it’s important to remember that no experience is too small. Some people even include parts on web-only series and YouTube channels. If you have a channel, it might help to include it – if it has had a few views. Use your judgement here, but don’t overlook any part. Even if you’re an extra in a soap commercial, that counts as experience. Keep updating your resume as you gain new skills or experiences. Learn a new accent? Include it on your skills section. Land a new gig as an extra in a feature film? That goes into the experience section. Take a short night class about body language in acting? That’s a class to add. Always update your resume as you build experience. Never lie. Yes, we said it above, but it’s important to mention again that honesty is always the best policy. Adding a couple of roles to your resume that you never actually landed isn’t a good way to stand out. Headshots matter too. Be sure to have a couple of headshots at the ready that you can include with a resume. Try to go for a few different looks – most will use a smile and a serious demeanor as the two standard headshots and it’s a good idea to do the same. Get this done professionally, and consider whether or not to go with color or black and white. Keep things professional and short. The ideal resume is one page long. If you have a huge amount of work as an extra, don’t fill up two pages with it. Include the most prestigious experience and classes and the skills you think are the best, and leave out some things in favor of keeping it shorter. No casting agent wants a five page resume. Use the right font. Use a professional one like Helvetica instead of something odd like Comic Sans. It might look unique, but it also looks very unprofessional. You’re trying to stand out for the right reasons here, not the wrong ones. Your resume is a very important part of your acting career. It’s important that you take the steps needed to craft a great one that will get you noticed, and the tips above should help. Remember them and take the time needed to really create a resume that will help you. It’s not something you should rush through, and is more important than many prospective actors realize.